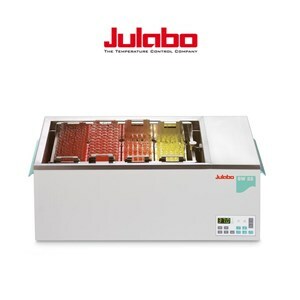 A shaking water bath from JULABO offers optimal convenience for the user with a spray water-protected membrane keypad and a bright MULTI-DISPLAY (LED) for indication of up to four different values. Cutting-edge microprocessor technology with PID temperature control ensures optimal temperature stability in the water bath. Adjustable upper and lower temperature warning functions protect the samples. Low liquid level triggers a full shutdown. 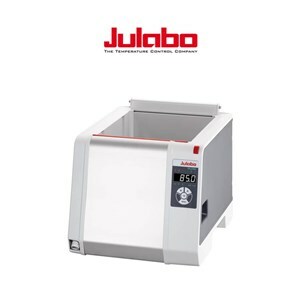 JULABO shaking water baths are suitable for continuous unsupervised operation. The bath tank and all parts that contact the bath liquid are made of high-quality stainless steel. PURA series includes high-quality water baths with a temperature stability of ±0.2 °C. With a working temperature range of +18 °C to 99.9 °C, PURA baths can be used for a wide variety of purposes, including routine laboratory tasks, holding samples at a constant temperature, incubation, materials testing, corrosion testing, temperature control of cultures, thermal testing of food, and dental applications. These units are spray-water protected with a membrane keypad and have an LED temperature display for straightforward operation. No distracting functional elements whatsoever are located in the bath, so the entire flat inside surface can be utilized, making it possible to reliably control the temperature of even small test vessels. The special enameled surface coating in all PURA water baths can be destroyed only by brute force.